← Add More Trees to Your Home and Enjoy Its Benefits! Our home is not just our dwelling place; it is where we are most comfortable in, the place where we can truly be ourselves. Because of this, we take steps and measures in ensuring that our abode is safe, secure, cozy, and beautiful. If you have a tall gate or fence, spruce it up with vines. Delicate, flowering vine species make for a lovely and romantic setting, plus they will also do a great job in covering or even complimenting parts of your fence that are old or worn out, giving an overall rustic look. Turn a dull, empty driveway into a pretty sight by first creating a slightly raised lawn island in the center of the driveway. You can then have shrubs planted for height and texture, and flowers for color and detail. You can even add some ornaments! Shrubs are a great way to use large, empty spaces, and transform them into a beautiful patch. Choose shrubs that bloom flowers in order to have some color as well. If you’ve got a lot of space in your yard, then it will be a great idea to create spaces where you can place garden chairs, a table, and outdoor benches. Make it as unique and exciting as you want! You can construct small hideaways using bricks and large, natural rocks, and create walls of vines or flowers in order to hide the garden furniture or even a fountain. 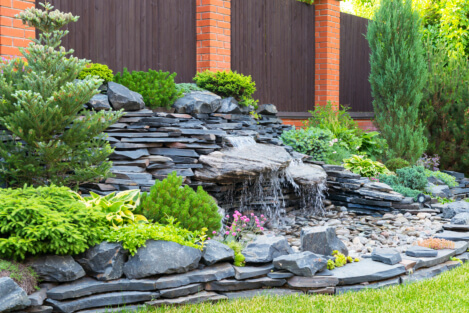 Streams, stepping stones, and intersecting trails are also great ideas to heighten the mystery of your surprise garden paradise. There are numerous ways you can transform your yard or land into an eye-catching and breathtaking mini paradise of your own and for your guests. If you need help in actualizing the garden of your dreams, then let us at AJ Tree Service give you a hand. We offer services in tree removal and landscaping in Broken Arrow, Oklahoma that can help transform your yard into a masterpiece. Don’t have a design in mind yet? Not to worry as we can also help you come up with an amazing design that suits your taste and meets your needs. We also provide tree removal service that is safe, efficient, and clean. For assistance in achieving quality landscaping and tree service in Tulsa, Oklahoma, talk to us at AJ Tree Service at 918-232-4853. This entry was posted in Professional Tree Service and tagged Landscaping, Tree Removal, tree service. Bookmark the permalink.